Whether you do sprints or IRONMAN triathlons, are a newbie or pro, you know how important nutrition is to the triathlete lifestyle and performance. Many triathletes consider nutrition the fourth discipline and aim to eat in a way that supports their performance. While this fueling focus is usually a huge benefit for health and performance, there are some mistakes commonly made by triathletes. Because triathletes tend to have training that includes a high frequency of lower-volume workouts (think an hour each of swimming, strength and running in one day), they ignore fueling for short efforts. In the end, these workouts add up and typically the race is much longer than the single workout. Training without sports nutrition neglects the specific energy needed to target optimal performances, even for short sessions. Plus, skipping sports nutrition during short efforts leaves the gut untrained to handle sugars and fluids under the high stress of race day. Due to over-focusing on achieving race weight or getting carried away with the latest fad diet, athletes tend to limit the carbs they desperately need to perform. The more you train and the higher intensities you train at, the more carbs you need. Athletes training low volume should consume 3 to 5 grams of carbohydrates per kilogram of body weight a day. This amount should increase to 7g or even higher for those training several hours a day. These carbohydrates are needed to provide usable energy for training, support hormone function, help prevent illness and supply certain vitamins and minerals. Research also indicates that in periods of heavy training, higher carb intake can prevent mood disturbances and overtraining syndrome. In addition to consuming enough carbs on a daily basis, it is vital for performance to consume enough during training. For workouts lasting longer than 90 minutes or race-prep workouts, aim to consume 45 to 60 grams of carbohydrates an hour. Eating whatever, whenever is a nice perk of not being an athlete focused on improving. However, proper nutrition timing can be the make-or-break part of your performance. Many triathletes ignore this aspect because it tends to conflict with normal eating habits (breakfast, lunch and dinner). If you're doing three training sessions a day, say a morning swim, a lunch run and an evening bike ride, that's three times during the day to focus on pre-workout, during-workout and post-workout training fuel. 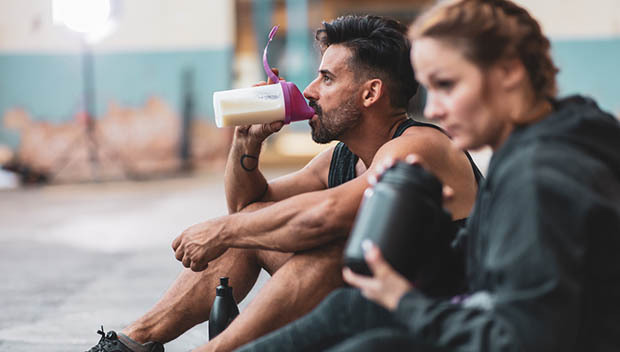 Athletes will get the most out of their training if they consume carbohydrates before and during workouts, while pairing carbs and protein immediately afterwards. Some athletes can get away with passing on a post-workout recovery shake, but triathletes need to be extra attentive to this aspect of nutrition. The golden window refers to the 30 minutes after finishing a workout when the body is most able to absorb and utilize glucose and protein to replenish and rebuild tissues. The optimal ratio of carbs to protein is typically 3:1 or 4:1, depending on the workout duration, long term training goals and body composition goals, but whatever ratio you choose, you have to get it in. This window is less important when athletes are training in low frequency and have 24 hours or more between workouts. However, that is rarely the case for triathletes who tend to have several sessions a day. Getting a small recovery shake in immediately after each hard workout (that might be more than one a day!) is key to helping long-term performance. Triathletes like to keep things dialed in and specific, sometimes to a fault. Watching your diet down to the numbers can really work to improve performance, but it is crucial to not lose focus of the big picture of having a balanced, whole food-based diet. Supplemental items, such as bars, gels, drink mixes, recovery powders, hydration mixes, protein powders, chews, electrolyte pills, beet powders, and more, become such a presence in the daily intake of triathletes that there can be little room for real food. However, these supplements are exactly that—supplements—and should be treated as such. Between training and during periods of rest, make sure to prioritize whole foods, like quality protein, legumes, produce and whole grains as these supply the calories, fiber and macronutrients your body needs. Having a variety of whole foods also provides a range of micronutrients, antioxidants, phytonutrients and gut microbes to keep your body functioning at its best. You might be making just one or even all of these mistakes, but by working to fix the problem, you can improve your overall health and optimize performance. If you feel like your diet is causing you stress or hurting your performance, reach out to a board certified sports dietitian to learn more.